At last, my 100th post! I wouldn't think I would write so much about food. Thanks for all you readers and food bloggers for inspirations, and a special thanks to all my research collegues, condensed matter physicists, skeptics, knife salesman, friends and my brother to make the collective cooking all possible. I hope this blog help to improve your culinary skills. One of my friend find that I don't have any real breakfast recipe as all of them are mainly dessert-like breakfast dish. So, my friend decided to organize a collective cooking early in the morning, and this is a great theme for the 100th post. Four of us managed to wake up early on a Sunday. Three of us made breakfast. 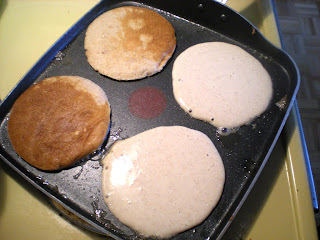 First, scrumptious banana pancakes were made by my Mexican friend, Mon. She basically inspired herself with many pancakes recipe online and made her own recipe. 1. 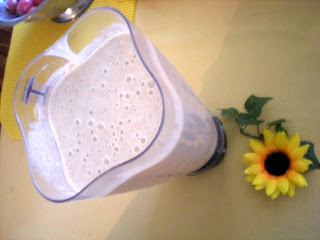 In a blender, beat eggs, milk and oil. Incorporate sugar, salt and baking powder. 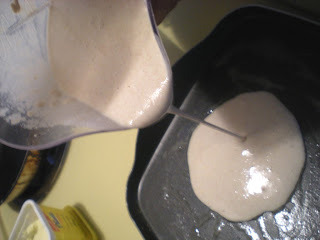 Finally, add bananas, blend until the batter is homogeneous. Blend in the flour. 2. In a large skillet, melt 1/2 tsp butter and pour a 5-inch droplet of the batter to the pan. 3. Cook until bubbly. Flip and cook again on the other side. Serve. The second dish is made by my French friend, Mathieu. He made Pain Perdu (or Lost Bread) which is also known as French Toast, but the French people hate to call it by this name. They call Lost Bread because it is a way to use stale bread, basically hard bread dipped in a mixture of milk and bread and served dusted with powdered or granulated sugar. 1. In a toaster, toast bread for 30-45 seconds to get a crunchy taste out of the bread. 2. In a large bowl, beat eggs, milk, sugar and salt. 3. In a large skillet, heat oil and melt butter over medium-high heat. 4. 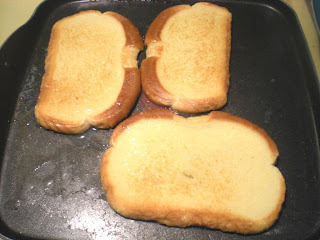 Dip toasted bread to the egg mixture and transfer to skillet. Cook for 1-2 minutes on each side until golden. Serve with syrup. 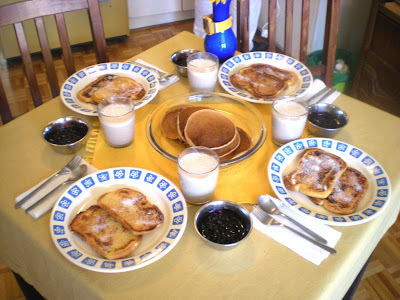 Now, my share of the event was to make a warm and rich homemade blueberry sauce which goes well with both the pancakes and the pain perdu. 1. In a small saucepan, stir sugar, cornstarch and water until smooth. 2. 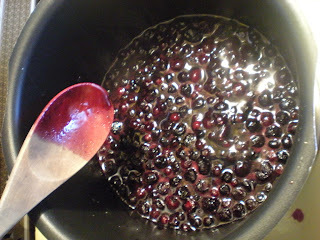 Add blueberries and heat until boiling. Stir occasionally. 3. Reduce heat to low. Cook for 1 minute longer. Stir in lemon juice. Serve warm. 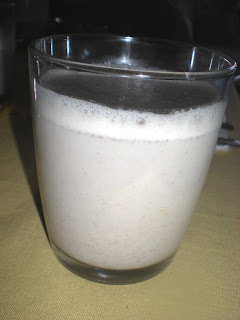 Finally, for the drink, my Mexican friend uses soya milk with a Spanish touch of orgeat mix. Orgeat mix (Horchata) is bought in powder form mainly composed of a mix ground rice, cinnamon, sesame seeds and other ingredients and must be mix with a liquid. 1. Combine all the ingredients until the dry ingredients are dissolved. Congratulations for your 100th post.....amazing!! Good idea to celebrate. You hv wonderful friends. Wow, looks like a delicious breakfast! I love banana pancakes and that sauce looks great! Congrats! 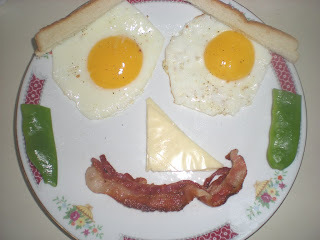 I love breakfast, and I don't post enough of it either. This looks great. Congratulations on your 100th post! This looks likes a delicious breakfast. Wow, what a spread! Congratulations on your 100th post! Well done on your 100th post and what a fine way to celebrate. The blueberry sauce looks great! Congratulations on your 100th post! Hope for 100 delicious more!